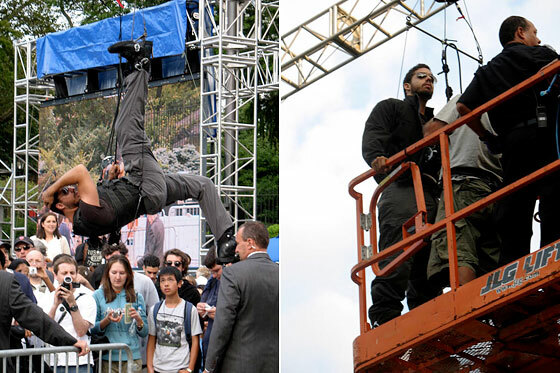 As you may have heard, magician/"endurance artist" David Blaine is currently hanging upside-down in Central Park. For the "Dive of Death" (named for ABC TV–special and poster-making purposes), he's hanging bat-style in what is usually the Wollman Rink — ahem, Trump Wollman Rink — for 60 hours, culminating tomorrow night. When he and the Donald did a press conference for the stunt last week, Blaine lithely demonstrated his hanging skills, but after just a few minutes already looked like his face was going to explode. So how would he fare after three days? Will he go blind like doctors say he might? Will he ever, say, do any frickin' magic again? We decided to do some sporadic checking-in to find out. He's wearing all black, including aviator sunglasses, and is being swung around the rafters. We are confused. Isn't he supposed to just be hanging "6 stories above the ground"? He stops moving, flips right-side-up, and dismounts onto an orange crane. We are even more confused. Turns out he has to pee (catheter and pee-bag-style), and get his vision checked out by a doctor. Given the go-ahead, he returns to the bat position, is moved inward and down, and stops about five feet off the ground. This seems to be where he's going to spend most of his time, greeting his public, signing autographs, doing interviews, and taking pictures. (We think it would be totally sweet if he also did some card tricks, but that's probably too much to ask.) His face looks puffy and he occasionally pulls himself to a horizontal position when the blood flow to his head gets to be too much. We overhear a little girl who has just gotten an autograph get asked by her father if Blaine was nice. "Yeah," she answers. "But he was a little loopy." The crowd had thinned, with about as many film crew members/handlers as spectators. The spotlights are turned on Blaine, who is now dressed more warmly in a jacket, some thicker pants, and a ski cap. He is still signing autographs, but he looks a little better. Not as disoriented, at least. In the distance, far from the crowds, we see a tiny nymphet, looking cold and wearing clothes that dwarf her. "Huh, that looks like Fiona Apple," we think. We happen to know there's a history between Ms. Apple and Mr. Blaine, so we keep turning to look at her, but she catches on and goes to a restricted area where we are not allowed. We ask someone official-looking if it was indeed Fiona Apple and she says it was "probably her," because she and David Blaine are "pretty good friends." Sweet! Blaine is still wearing the warmer clothing, and he's back to wearing the aviator sunglasses. With the ski cap he looks a lot like Will Smith in the posters for Hancock. 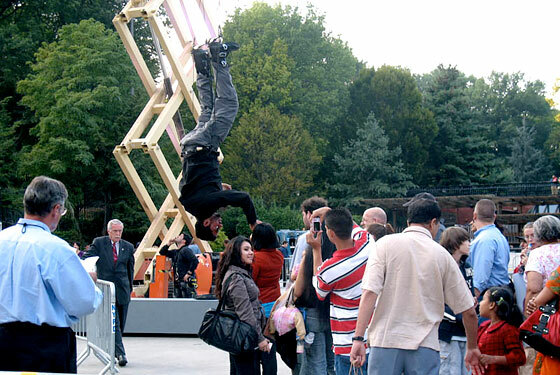 He's still hanging upside-down, but there's only about a handful of spectators, including a man that identifies himself as being from Good Morning America and is setting up a shoot. The metal barricades funneling people up to Blaine have been replaced with red velvet ropes. One of Blaine's handlers holds some Vaseline up to his face. Blaine says something, barely audible, and the handler leans in to hear it. He then retreats, and announces to someone else "He doesn't want Vaseline, he wants ChapStick." A woman with two young children is in the crowd, and she looks concerned. That seems to be the presiding sentiment among visitors, along with morbid fascination. She asks Blaine what it's like to be hanging upside down. "It doesn't feel so good," he answers.